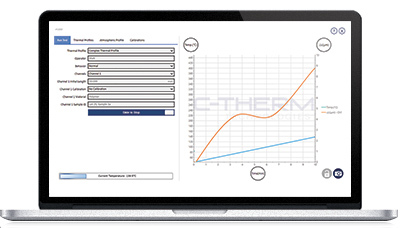 The hallmark of any C-Therm instrument is an easy, intuitive user-experience and this is especially true for C-Therm’s dilatometers. The user interface is simple, yet powerful. Quick-select heating profiles allow users to customize testing parameters and easily repeat tests - all from the same screen! C-Therm’s dilatometer acquisition software can be additionally upgraded with Calisto from C-Therm’s partners at Setaram Instrumentation. Calisto is an intuitive and powerful analysis software module with significant mathematical features including: glass transition determination, calculation of coefficients of thermal expansion (alpha, true alpha, average alpha), derivative, smoothing, temperature correction, data spike removal, and many more specialized functions.